APVAT Act-2005 and CST Act 1956 – Submission of utilisation details for Manual Waybills and activation of e-way bill facility – Reg. 2. Several requests received on 15.05.2014 through mail. The attention of all the Deputy Commissioners (CT) in the State is invited to the subject and reference cited, wherein it was informed through the scrolls mentioned above to upload the utilisation details for the manual way bills obtained from CDSC/e-DSC 6 months back (by uploading online) to obtain fresh forms and also to generate e-way bills. 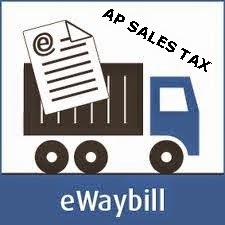 Inspite of several remainders mentioned above, the dealers or the Departmental Officers have not taken action to upload the same or approve the cancelled e-waybill bills. In view of the above on 15.05.2014, the e-waybill utility was blocked to such defaulters. However, due to several requests from the dealers and the Departmental Officers, the facility was restored with a condition that they should take action to upload the utilisation details and approve the e-waybills canellation requests. Keeping in view of the prority of the items of work, the date is extended up to 23.05.2014 for uploading the utilisation details of way bills taken 6 months back/to approve the cancelled e-waybills. It is also informed that System will not allow to download any fresh forms after 23.05.2014 in case of dealers who failed to upload such details/approve cancelled e-Waybills. The Deputy Commissioners (CT) are therefore requested to take necessary steps to inform such defaulters to immediately upload the utilisation of manul waybills details issued 6 months back.They should also take steps to approve cancelled e-waybill details through the CTD portal.